'While they hold forth in newspaper columns, maybe having realised that true gravitas is earned via newsprint not digicams, he does nothing of the sort. ''He breathes and lives TV news,' says Saisuresh Sivaswamy. The strange thing about Arnab Goswami is that he is not the greatest journalist India has produced. Bigger names than him have gone gently into the good night when their employer called time on them. Why, even within the humongous Times of India group, of which the Times Now television network is a part, editors have come and gone with the reader none the wiser. Some had to be sent out kicking and screaming, true, but not one of those exits evoked more than a passing comment, the copious conspiracy theories and doomsday prognostications if any reserved for the more salubrious confines of press clubs across the country. So what makes Arnab G special, so special that his possible exit -- while he has conveyed to his colleagues his resolve to quit, the ToI group, unusually, is said to be employing its persuasive skills to make him change his mind -- has generated such interest among the chatterati, set social media afire, energised dormant WhatsApp groups, not to mention get journalistic tongues wagging? It certainly cannot be journalistic excellence, never mind the TRP ratings and the self-congratulatory Super Prime Time ads extolling the Times Now marquee show, the Newshour. After a long hiatus I sat down to watch Tuesday's episode, along with I suspect a billion other Indians, and what I saw on television is certainly not what is taught at the best J-Schools in the country, the world, or in newsrooms all over. It remains the kangaroo court I remembered from many months, even years, earlier. At best it is an inquisition, Goswami playing, while not the dreaded Torquemada, at least a haranguer in chief. The parameters of the day's show are set by the star anchor at the outset; what remains is to give those who disagree with him a bad name, and hang them. For the sake of balance -- yes, that quaintest of words fast going out of fashion in newsrooms -- there are two sides. Goswami is not the neutral judge waiting to pronounce judgment on which side is correct, no, he is actively aligned with one side, so there can only be one way the verdict will go. There is a lot of name-calling on the show, a lot of chest-thumping, concepts like patriotism, nationalism, are bandied about freely, there are around 8 persons on the show each trying to out-shout the other, but Goswami easily takes the decibel award. After all, he has been doing it for so long that he has the practised ease of a maestro. He stares at obstreperous guests with a basilisk eye and it is a miracle they don't turn to stone. I suspect there's a doctor at hand somewhere because someone soon is going to have a coronary on the show, on live TV no less! It is clearly not journalism as the word was understood before two-paise politicians equated it to the world's oldest profession. At best it is a daily dose of drama, melodrama. Or to be more charitable, a daily symphony orchestra, fortissimo, with Goswami as conductor. To be fair to Goswami, the television camera is his only fix. Unlike other TV stars who rule social media, Arnab is nowhere to be found. While they hold forth in newspaper columns, maybe having realised that true gravitas is earned via newsprint not digicams, he does nothing of the sort. He breathes and lives TV news. Old-timers will recall Goswami's onscreen persona was the exact opposite before his Times Now outing. In his previous TV network, where he was understudy to the then stars of TV journalism he would go on to eclipse, Goswami was as affable as they came, not this baying bloodhound he changes into at 9 pm. Even after Vineet Jain recruited him around 10 years ago, to helm his floundering TV station, Goswami hadn't changed. The changeover happened at a seminal moment for India, the 26/11 terror strikes on Mumbai. Based in Maximum City, unlike his then exalted peers who work out of the national capital, Goswami's marathon non-stop coverage that clocked 100 hours, made him realise the magic of the small screen and its potential. After that there was no looking back for him, or Times Now. As the man evolved/changed into the Prime Time Pasha, legends too started to emerge around him. Was it true that before walking into the 9 pm spotlight, Arnab would go to a wall and feign punches and hurl the choicest abuses, all in a bid to work himself up, to get the adrenaline flowing when he faces the camera? If true, now you know the secret. Was it true that while brash and offensive with colleagues, the minute you put in your papers he would seat you down in the beanbag in his cabin, and try to change your mind? 'You think I am being harsh? See how I am being buggered by my boss,' would he say, and show you the smses he has received from yon high? Maybe. The point is, he was now lord and master at Times Now, and if this fact didn't sit too well with the real lord and master, the latter didn't show it. Yet. But the point also is the Times of India is a group where no editor is a star, no sir. The dismantling of the star culture went back to an innocuous interview one editor-in-chief gave a society magazine many years ago in which he termed his job the second most important one in the country. It didn't take long for the man paying his salary to show him his place, and the door, and thus ended the journalist as star at the ToI group. It could not have been easy for such a group to watch the growing deification of the Times Now Editor-in-Chief. If D K Barooah was around he would have famously said Arnab was Times Now, Times Now was Arnab. Not a great situation for the man paying the piper to be in, so the compact between owner and employee was bound to unravel some time or the other. Or be blamed for the rout of the Congress party, as Priya Dutt told us in 2014? There are no two ways about it. 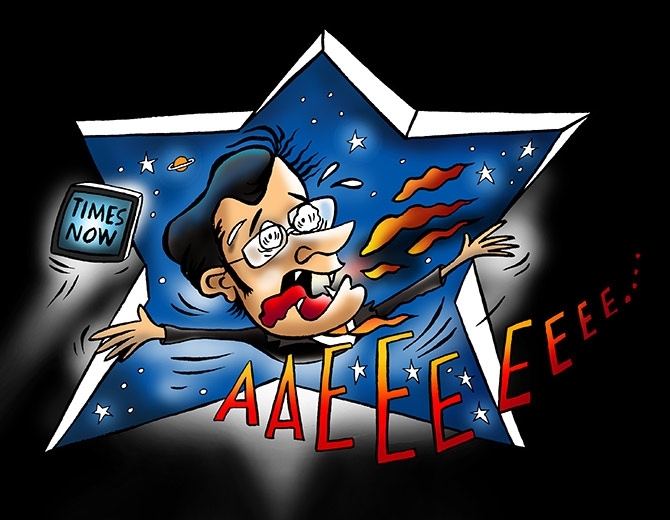 Arnab Goswami evokes strong passions all around. You can either love him, or you can hate him. But you cannot ignore him. In this, he so resembles the only man before who he seemed less of the pugilist and more of the puppy he was when he interviewed Sonia Gandhi on an airport tarmac in 1999. So, given this similarity, should Arnab be called the Narendra Modi of television journalism? VOTE: Who is the best candidate to replace Arnab?